What is published here are the posthumously “established” notes for Roland Barthes’s lectures of a two-part course called “The Preparation of the Novel,” along with a brief assortment of related materials—a series of photographs, by Nadar, of people known by Proust, accompanied by Barthes’s notes for a seminar that never took place; a smattering of haiku referred to or cited in the first part of the course; and, finally, photographic reproduction of eight pages of notes, possibly for a novel, accompanied by translations of the same. 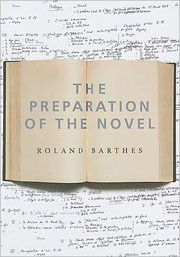 This is not a course on the novel, nor on specific novels, nor on novelists, nor the writing of a novel, but rather “the preparation of the novel,” premised—as Barthes insists all courses must be—on a “fantasy,” a fantasy related to the novel, to the desire to write, and certainly to what Barthes calls “the jouissance, the joy of writing,” which, as jouissance, is as much about the anticipation—the preparation, even—as about the fulfillment or completion of the act itself. A sense of what to Barthes must have been delicious postponement, edging around the event itself, characterizes this course, but the pleasure here (unlike, say, the likewise posthumous publication of Barthes’s course from the year before this course started, The Neutral, published in 2005 by Columbia University Press) isn’t necessarily contagious. While The Neutral represented a climax of theorizing, the culmination of an exhilarating breadth of reading and thinking and writing, The Preparation of the Novel is tentative, a preliminary-yet-public thinking around how to frame the issue under consideration. While the editors push the narrative that Barthes was, perhaps, preparing to write a novel (hence the reproduction of notes at the end of this volume), there is a sense, throughout, that whatever Barthes wanted to do next, it would involve a radical departure from previous forms—hence the elaborate “preparation,” and hence, too, the fact that those photographically reproduced pages are labeled Vita Nova, after Dante’s experiment in pushing the limits of form. Both of these aspects are, for Barthes, intimate, autobiographical concerns—from practical considerations about textuality (“don’t underestimate what the layout of speech on the page can do”) to consideration of the drain that “Administration,” even “managing your social circle,” exerts on the writer’s ability to write, reflection on the “relief” from such obligations tuberculosis offered Kafka or how Rimbaud’s “spectacular scuppering of Writing” relates to the limits of language itself. As critic and theorist, Barthes has always been marked by a dual focus on both the textual and the domestic. Both of these realms give him pleasure, and his work—his writing—is always also very much a pursuit of pleasure. When Barthes examines the diets and eating habits of famous novelists, for instance, he is indulging a desire that runs throughout his oeuvre. However much he might turn attention, in earlier works, to “the writerly,” he also always remains the writer who mused on the centrality (if not sacrality) of the writer’s notebook, diary, and daily habits. Fitting, then, that this volume preserves his pages of notes as an artifact, a relic even, discovered only after his death two days after the course’s last meeting. The identification with Proust certainly reverberates with Barthes’s loss after his own mother’s death; he argues that “in In Search of Lost Time . . . the Mother-Grand-Mother [is] the one who justifies the writing because the writing justifies her,” while in his own work (consider the remarkable Roland Barthes by Roland Barthes) Barthes likewise gave his mother a central role. The general reader, then, will find this affiliation with—even affection for—Proust to be more enticing than claims that “the Novel is a structure,” or that the writer’s Desk is likewise “essentially a structure . . . a localization of functions and connections between microfunctions.” Barthes becomes exciting when readers recognize and appreciate his sensual engagement with such “microfunctions.” A domestic writer who writes lovingly of routine, of solitude and fantasies of solitude (oh, to study classical texts in winter, next to a source of warmth! 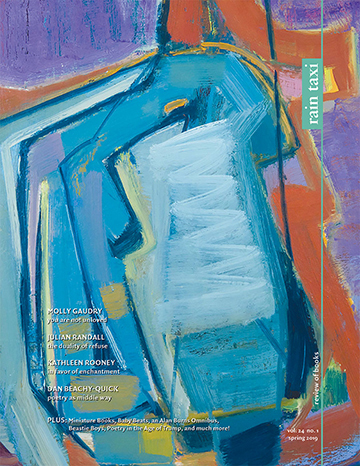 ), and of both the mechanical intricacies of a text and the broad, contextual preconditions for such texts, Barthes, in these lectures, pursues his own pleasures at his own pace, actively avoiding his old nemesis, Boredom (“the metaphysical condition of Man”), while virtually caressing the details of both text and life that he offers up to his audience on these pages. Consider this passage from Proust: “My existence is extremely unsociable; I love its uneventfulness, its quiet. It is complete and objective nothingness.” Barthes holds this on his tongue until it melts to pure sweetness. For readers who can share such a pleasure—and who can acclimatize to the particular form both of Barthes’s writing and this truncated, lecture notes format—The Preparation of the Novel will generate some jouissance indeed.